Networking Night would not be possible without our dedicated Sponsors! 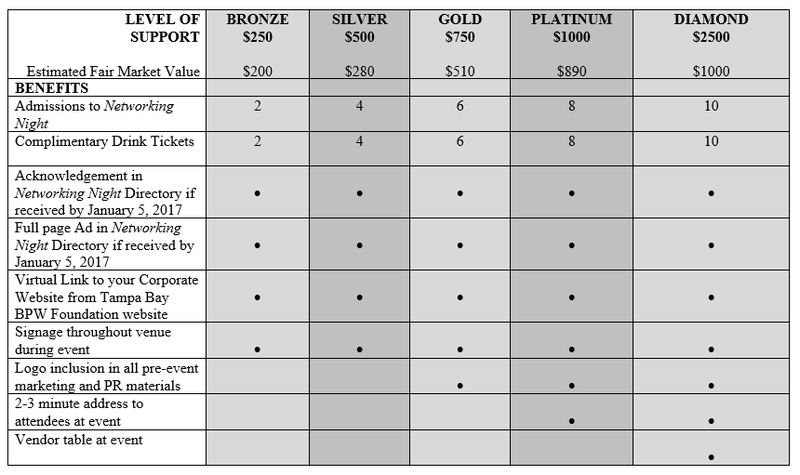 Sponsorships are available in the following categories. TAMPA BAY BPW FOUNDATION IS A 501(C) (3) NOT-FOR-PROFIT ORGANIZATION AND ALL GIFTS MADE ARE TAX-DEDUCTIBLE TO THE EXTENT PROVIDED BY LAW. A COPY OF THE OFFFICIAL REGISTRATION AND FINANCIAL INFORMATION MAY BE OBTAINED FROM THE DIVISION OF CONSUMER SERVICES BY CALLING TOLL-FREE 1-800-435-7352. REGISTRATION DOES NOT IMPLY ENDORSEMENT BY THE STATE. 100% OF THE CONTRIBUTIONS RECEIVED ARE RETAINED BY THIS ORGANIZATION. Scan your business card or send ad copy to Heather.Brown@Frazierdeeter.com. Note that advertising materials MUST be received by 1/4/2019 to be included in the Networking Night Directory. Materials can be sent by mail to Tampa Bay BPW Foundation, PO Box 320925, Tampa, FL 33679. To register and pay online, please click on the link for the level at which you would like to sponsor: Coming Soon!